Lady Boss Dr. Lalita Sharma is eradicating illiteracy, one day at a time. Read how! Women power can never be subdued, and as we celebrate the month of women power, here we are with yet another #ladyboss – Dr. Lalita Sharma, an assistant Professor at the St . Paul Institute of Professional studies, Indore who provides selfless services to the community by conducting Literacy classes for almost 300 Underprivileged children and teaches them Academics, virtues of life and personality development in the four neighbourhoods of Vijaynagar,Indore namely Scheme no 113, RaghunandanBagh colony, Lahiya colony and KabetKhedi. She has been providing her philanthropy services since January2010. Dr. Lalita has also been selected in the top 100 women achievers, by ministry of women & child development in collaboration with facebook, women that have made a difference in communities across India! “I believe that educating a girl is educating the generations to come”. Let’s know more about Mrs. Lalita, and how she aces the balance between her family life and what her heart desires. When she shifted to Vijaynagar, the area was relatively new for her. When she found out that the parents of children around her are working especially the mothers who work as maids doing household chores to support their family. And the children in-turn were left unattended for long hours, resulting in them roaming around, not doing anything, bunking school, and even smoking! This rattled Mrs. Sharma, just like it would any other person. However, what was different here was her taking a step to change this. 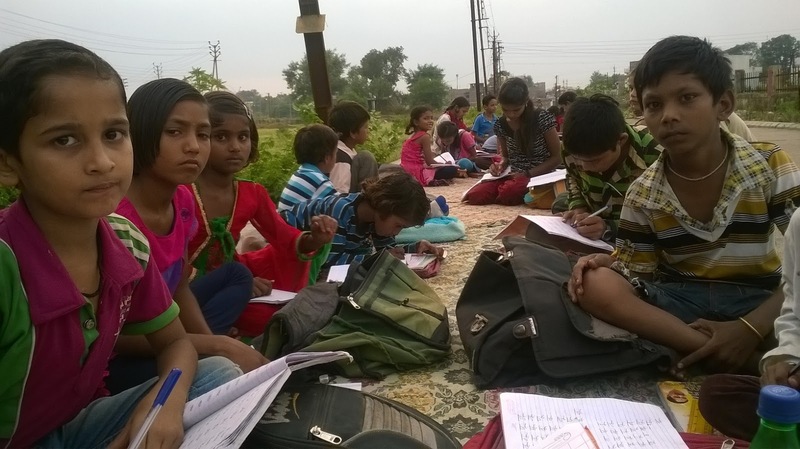 Thinking on the lines of these children needing the right direction, and some moral support, she began ‘Sanskar classes’ with the help of her family. She enrolled every child, and youth, even the school dropouts; every evening saw a hoard of young people coming to these classes that aimed at channelizing their strengths, and capabilities into something constructive. “When we started the classes , almost 40% of the students were either drop outs or not admitted to the school, I even visited some of the homes of these students and gradually all the students got admitted in the schools now making it 100%”, says Mrs. Lalita. Sanskar classes is not just an evening school, it provides proper academic education from the 1st standard to the college level. The kids are trained to be good individuals, to be truthful, honest, loving, caring, sharing, etc. through prayers, learning and understanding of quotations, colouring, drama, songs and cooperative games, simple acts of services like tree plantation, cleanliness awareness programs, visits to orphanage etc. During the holidays the girl students are also given training for Tailoring, Jewellery making, Flower making, and other skills so that they are empowered and can use these skills effectively in the future to earn their own money. The elder brothers and sisters of these children are also provided training to teach the other children in their own locality. The parents of these children are visited sometimes and they are also invited for the meetings time and again. The family of these children also host Devotional Satsangs sometimes, where the participants of the Sanskar classes share their learnings through stories or drama. Considering these classes are free of cost, several enrolments are seen throughout the year to get their kids registered in their classes. Mrs. Sharma however, tries giving the girl child more preference. She says, “I believe that educating a girl is educating the generations to come”. There are also some instances where the school teachers of government school tell the students who are already coming to Sanskar classes to take along their other friends so that they can learn all about academics, and other etiquette too . Mrs. Lalita’s aim is to educate young kids irrespective of where they come from, to instill good values in them and helping them chanelise their innate talents by polishing them with good manners, ethics, moral values, and compassion. She has also started hiring teachers alongside her, who can help her. It’s amazing how Mrs. Lalita has been managing her profession and changing the society too, one day at a time. While most of us can’t get beyond bickering about our nine-to-five jobs, some women are breaking the cycle by going a step forward and looking out for those who are in need to help or the right direction. Indore HD salutes the spirit of these women!